Shinjini, the CEO & Founder at The Das Media Group, to deliver keynote at Europe's fastest growing tech conference on the trends of digital entrepreneurship. ATLANTA , GEORGIA, UNITED STATES, April 9, 2019 /EINPresswire.com/ -- Shinjini wanted to find a way to combine her passions for speaking, mentoring, business, and technology into one platform, and the media has given her the opportunity to do exactly that. She is building a global digital community of go-getters who care very deeply about achieving their goals, but who often, feel stuck about how to go about achieving their personal and professional goals. Das offers positive, aspirational, and uplifting how-to advice, mental mindset models, and inspiring little playbooks to live like a go-getter on her social media channels reaching more than 5 million go-getters around the world every month across all platforms. Throughout her experiences as a keynote speaker with the U.S. Department of State empowering women entrepreneurs to build businesses like go-getters and youth to achieve their goals like go-getters, she has firsthand observed the societal wealth shifting powers of teaching underprivileged or developing communities digital and social media technology to start and scale businesses online. Women and communities of go-getters Shinjini has empowered with actionable brand building strategies in Bolivia and Paraguay with the U.S. Department of State, including the American Chamber of Commerce Bolivia, have shared their experiences of growing their own personal brands as influencers on social media. They have since turned these personal brands into thriving businesses after offering monetized product lines which fit their personal brands, emphasizing that digital media is the critical reason their family is surviving today. Since stable incomes are hard to come by in developing countries marked by a connection based society of who you know, lack of privilege stings. Shinjini advocates leveraging the use of a digital economy to democratize access to opportunity and wealth-building. The speaker team at the Dublin Tech Summit noticed Shinjini's unusual mission and personalized 1:1 advice on social media for her go-getters and invited her to share her message on one of the largest technology and business-focused stages in Europe along with the Chief Decision Scientist at Google, Co-Founder of Eventbrite, Chief Technology Officer of NASA, among other trailblazing global leaders. Shinjini is committed to building a digital media content platform to nurture her go-getters' personal development with audio, video, digital, and social content which helps them to solve their own personal challenges and learn actionable strategies to live like go-getters in life and in business. Shinjini's first memoir at 26, "Unapologetically, Shinjini" is now out at www.unapologeticallyshinjini.com. Shinjini Das became a media proprietor at 26 with experience in software technology consulting and digital marketing strategy. She owns and sells her own branded media properties D2C, directly to her consumers of go-getters around the world, as well as B2B, to businesses looking for empowering media content to attract and engage their target audiences. She has built a global digital community of go-getters looking for motivation and actionable strategies to accomplish their goals who tune into her media content teaching go-getters how to live like a go-getter in life and work across video, audio, social media, and traditional media to the tune of 5 million(s)+ views a month created by the media company she founded at 24. Her experience also includes leading a 15-person team of global freelancers in South Africa and America who partner with her to create, produce, and distribute native and branded media content across a range of native and client media channels. Shinjini serves as a keynote speaker specializing in youth empowerment and women's entrepreneurship in the US Department of State's US Speaker Program, a public diplomacy program encouraging US citizen experts to empower local communities in US Embassy regions, to build stronger mutually beneficial partnerships between US and partner nations. She teaches them how to live like go-getters. 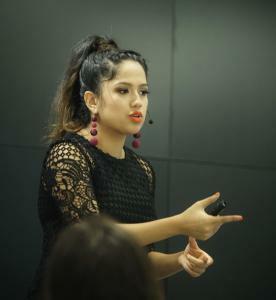 She spoke to 1000s youth and women entrepreneurs in Paraguay and Bolivia in Spanish in 15+ lectures on social media marketing and her digital entrepreneurship journey to encourage them to become go-getters and start digital businesses. Shinjini studied at Georgia Institute of Technology (BS Honors in Industrial and Systems Engineering), where she graduated as the Undergraduate Student Commencement Speaker and on the Omicron Delta Kappa National Leadership Honor Society Student Advisory Board. About Dublin Tech Summit: Dublin Tech Summit is a two-day global tech conference that sits at the heart of the Irish tech scene. In just two short years, DTS has emerged as Ireland’s largest tech event as well as “Europe’s fastest growing tech conference." DTS brings together some of the most influential tech and business leaders to Dublin for two days of growth & development, knowledge sharing, covering the latest trends. Exploring a myriad of themes and topics such as emerging technologies, diversity, scaling for startups and much more, DTS has built a community of innovators, co-founders, developers, and c-level decision makers who are turning ideas into reality and affecting global change. With 10,000 attendees from over 70 countries, 200 fascinating speakers, and 300 global media representatives, DTS has become an attractive platform for the world’s leading brands to accelerate growth within the Irish market.